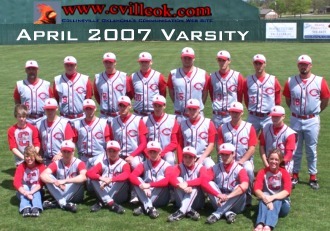 2007 CHS Cardinal Varsity Baseball -- L-R Back Row: Head Coach Tony Reeder, Jonathan Woods, Garrett Tole, Jeremy Guest, David Chester, Kyle Keith, Tyler Goodman, and Coach Damon Herald. Middle Row: Dillon Harwood (manager), Bobby Shoate, Garrett Thurman, Harrison Mendez, John Puckett, Kevin Phillips, Tyler Nair, and Shawn Curtis. Front Row: Bethany Aguillard (manager), Riley Murr, Randy Rogers, Brad George, D.J. 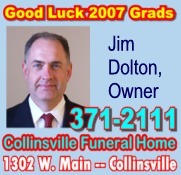 Neighbors, Lane Coulter, and Kerry Schultheiss (manager). 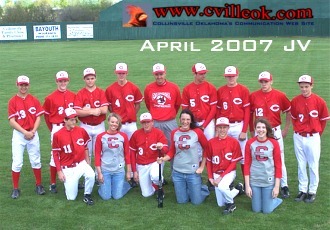 2007 CHS JV Baseball -- L-R Back Row: Cameron Storm, Jayce Crowder, Jordan Pasquelle, Jono Nair, Coach Art Smalyago, Dylan Weabe, Cody Moore, Anthony Cornelius and Kyle Bunch. Front Row: Ben McCombs, Amanda Davis (manager), Aaron Feigle, Kelsi West (manager), Channing Newland, and Maddy Schultheiss (manager). CHS Baseball "Fan Appreciation Night" is Monday April 23rd with .25 cent hotdogs at the home game against Bristow starting at 4:30pm. 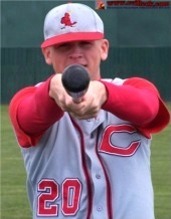 This Week At Skiatook: The CHS Baseball Cardinals play at the Skiatook tournamant this week: (April 19th) Thursday at 5:45 -vs- Cascia Hall / (April 20th) Friday at 10am -vs- Coweta / (April 21st) Saturday 2:30 -vs- Grove / then either 4:45 or 7:30 Sat. 2007 CHS Baseball Seniors: L-R: Tyler Nair, Jeremy Guest, David Chester, Jonathan Woods and Tyler Goodman.